ARCHANGELS is a company based in God's Country (beautiful sunny Southern California), dealing in Rare and Unique Paper Collectibles. We specialize in vintage Comic Books, Original Comic Book Artwork, Hollywood Movie Posters and other related items as well. We are Senior Advisors to the Overstreet Comic Book Price Guide and a Charter Member Dealer with the Comics Guaranty, LLC (CGC). For other wonderful items, make sure to visit us at our About Me Page. 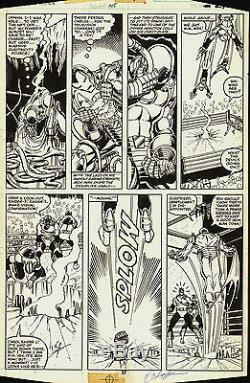 Iron Man #145 Art by John Romita Jr.
Pulse-pounding no-holds-barred battle page for the Invincible Iron Man #145 (Marvel Comics, 1981) by John Romita Jr (pencils) and Bob Layton (inks). This page features the key climatic engagement between Iron Man and a trio of adversaries known as the Raiders for the story entitled, Raider's Rampage! Marquee Iron Man action pieces from this time period, penciled by Romita Sr. And inks by Layton, are quite rare, highly prized and sought after in the market place and are seldom seen offered on the open market. Art is in excellent condition with an image size of 10" x 15" and signed by Layton. The item "Iron Man #145 Battle Page Art by John Romita Jr" is in sale since Tuesday, March 24, 2015. This item is in the category "Collectibles\Comics\Original Comic Art\Interior Pages". The seller is "water-walker" and is located in San Diego, California. This item can be shipped to North, South, or Latin America, all countries in Europe, Japan, Australia.